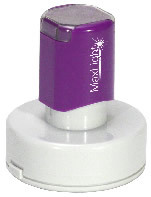 MaxLight pre-inked rubber stamps offer exceptional impression quality while eliminating the need for messy stamp pads. MaxLight pre-inked rubber stamps give you thousands of impressions before re-inking is needed. The dust cover protects the impression area against accumulation of dirt and debris. From address stamps to inspection stamps to daters, MaxLight pre-inked rubber stamps come in sizes to meet nearly all marking needs. MaxLight pre-inked rubber stamps give up to 50,000 impressions before requiring more ink. Five colors of ink are available: Black, Red, Blue, Purple and Green. 2" Round Seal Stamp with custom Content. Refill Ink for Maxlight, PSI and other Pre-Inked Stamps.